​through the Seattle Cancer Care Alliance. You are invited to learn more about us on this site, and we welcome all who are interested to join us. The Pacific Northwest Needle Arts Guild was organized in 1972 for educational purposes, to encourage individuals, without discrimination, to pursue knowledge in the needle arts and to raise and maintain standards of technique and design. 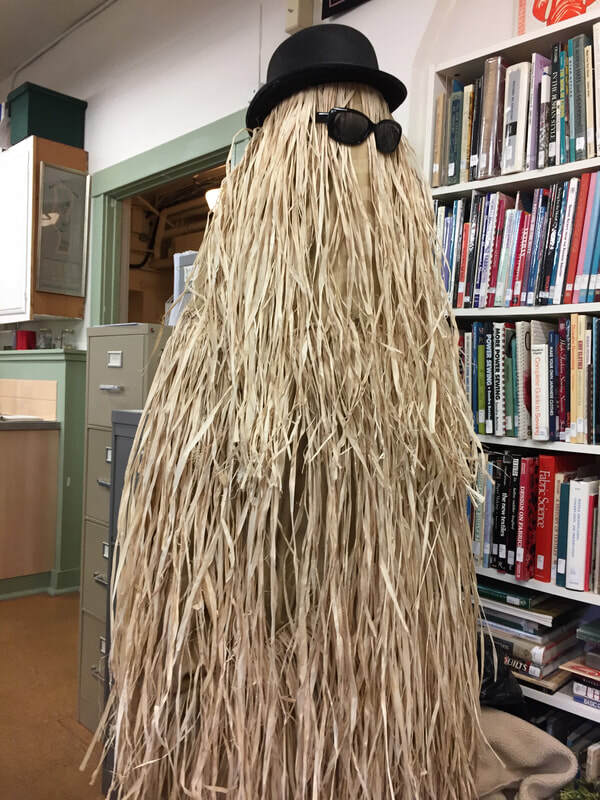 PNNAG member Gini Tripp in costume as Cousin It from the classic Addams Family. Three hula skirts and a recycled bed sheet formed the base for her hilarious disguise for Halloween 2018. Gini also volunteers at UW Northwest Hospital Gift Shop. She dressed as one of Santa's elves for the Gift Gang distribution in December. Gini has dived right into PNNAG activities and can also be found at Sno-King Satellite, Wearable Arts Study Group, and UFO Study group where she is constructing a cushion that is a dead ringer for a fluffy cat.